In 1922 a new ship was launched from the Grangemouth Dockyard shipyard, Grangemouth, Scotland, for the Denholm Shipping Company of Glasgow (Manager, John Denholm). This company was established in 1851 by John Denholm. The ship was christened SS Willowpark with a registration number of 145699 and her signal letters were KMFL. The ship was yard number 404 and an identical ship called SS Rowanpark was also built. These ships appear to have been named after properties near Greenock, which is just outside Glasgow. Grangemouth Dockyard also had a dockyard at Greenock. The Willowpark was 1931 tons gross and 1146 tons net. She was 280 feet long and 42 feet wide with a draft of 19 feet. She was powered by a single triple expansion steam engine of 179 hp which got its steam from a (very large) boiler. This drove a single prop. I do not know much of its early days at all. An entry in shows that on 29 October 1930 the ownership may have changed to North British Shipping Company. 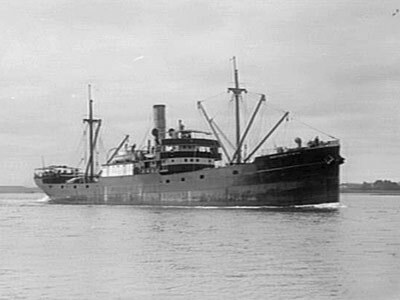 However, a report in The Canberra Times on Wednesday 27 August 1930 reported that 100 stranded Australian sailors waited at Australia House in London as an agent interviewed men to raise a crew of 20 to take the chartered ship known as SS Northern Firth to Australia to engage in shipping there. Captain James Patrick was said to be the charterer. In the Argus on Saturday 11 October 1930 it was announced that the Northern Firth would run on the Melbourne to Brisbane route, stopping at Sydney and Newcastle. On about Saturday 25 October 1930 she was in the vicinity of Thursday Island, Cape York (the pointy top bit of Australia for non-Aussies). I assume that she started running on the route some time about late October 1930. On Wednesday 19 November 1930 the Northern Firth arrived in Newcastle, from Brisbane I think. She left Sydney on 21 November 1930 for Brisbane. On 12 December 1930 the Northern Firth left Sydney for Brisbane. On Wednesday 24 December 1930 she left Melbourne for Newcastle. She seems to have continued on the Melbourne to Brisbane route for the rest of her days. The 1932 issue of The Mercantile Navy List and Maritime Directory shows that the ship's name is now SS Northern Firth. It shows it as being registered in Sydney since 1930 and the owner as North British Shipping Company of St Vincent Streeet, Glasgow. I have read that the ship was owned by the Patrick Steam Ship Company but this was not correct. As of early 1932 the ship was still owned by North British Shipping Company and it was under charter to James Patrick and Company of Bridge Street, Sydney. Note that some reports I have seen of the wrecking state has dates that vary from the following by one or two days. The following dates are correct. On Friday 19 February 1932 the SS Northern Firth was due to leave Melbourne under the command of Captain James MacDonald (also reported as McDonald) for Sydney with 1800 tons of general cargo. However, I believe that it did not actually leave till noon on Saturday 20 February 1932. At noon on Sunday 21 February 1932, William Charles Golding (holder of a Board of Trade Foreign Going Certificate and with 14 years local experience), Second Mate, took over the watch and was in charge of the ship. Captain MacDonald was asleep in his cabin. At 3:30 pm (or between 2 and 3 in one report and at 5 pm in another) when just south of Ulladulla, she struck rocks just off Brush Island. There is a shallow reef to the south-east and east of the island, so it is assumed that this is what was hit. Captain MacDonald rushed to the bridge and asked "Why didn't you call me if you were in doubt?". Golding replied "I wasn't in doubt". Donald Wittison was steering the ship when she hit, later said that the ship hit a reef about one mile off Bursh Island and he did not see any white water in this area. The First Mate, William Paterson was later to express the view that the reef extended out further from the island than marked on the chart. A hole was torn in her side and the engine room quickly filled with water. The engines were soon out of action. Strong North-easterly winds soon drove her aground on the north-esatern corner of the island. The SS Yarra arrived on the scene at 4 pm. She stood by for about two hours (not four as in one paper) and at 6 pm when it was obvious the crew was safe and the ship beyond salvage, she left for Sydney. Captain MacDonald ordered the ship to be abandoned. All the crew got to shore safely. Locals were soon on the scene and some of the cargo (shoes, clothing and liquor) was pilfered before a guard could be placed on the wreck. Legend has it (well at least it is claimed in the mid-2000s) that rats went ashore from the wreck and affected the native mammals and birds on Brush Island. However, I doubt that this is true as the island is only a very short distance off shore (less than 200 metres) and I am pretty certain that rats would have made there way there well before this. Tents were erected on the island and the crew stayed there. Two Aborigines took water across to the island. On Monday 22 February 1932 it was reported that the cargo was worth £90,000 and was totally lost. It was also reported that the ship was in a position such that it was unlikely to withstand heavy seas. On the evening of Thursday 25 February 1932 the SS Jap left Sydney with a salvage team and gear. There were reported to be several hundred cases of liquor on board. By Tuesday 1 March 1932 a fair bit of cargo had been salvaged. This included drums of glycerine and white spirit, barrels of syrup used in the manufacture of confectionery, barrels of beer and cases of "spirituous liquor". On Wednesday 9 March 1932 the situation of the wreck was considered "hopeless" and the workmen still on Brush Island (not sure if they were the crew or just salvage personnel) were ordered to return to the mainland. The hull was split and water was pouring into the holds. 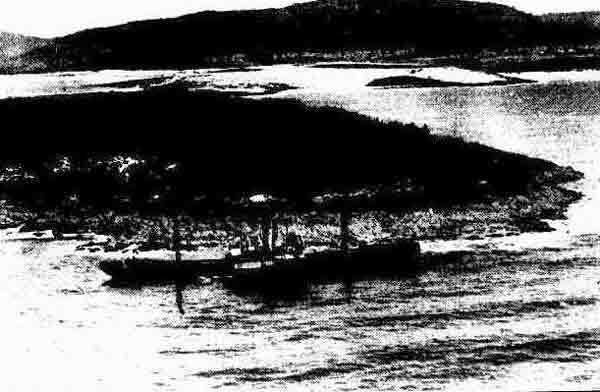 The next day the salvage was completely abandoned and the tugs that had been standing by returned to Sydney. The vessel was "rapidly breaking up". The SS Marsina was chartered by Patrick and Co to replace the SS Northern Firth. A Court of Marine Inquiry was held in Sydney on 14, 15 and 16 March 1932 before John William Malcolm Laidlaw, Chief Stipendary Magistrate of New South Wales. He was assisted by Captains M.M. (?) Osborne and C.B. Mercer. The Director of Navigation, Captain J. Davis, preferred a charge of failure of duty against William Charles Golding, Second Mate. On Wednesday 16 March 1932 the Marine Court found that the charge was not sustained as the ship had hit a submerged object that was not recorded on the Admiralty Chart. (It is intersesting that this was the same day that Phar Lap won the Agua Caliente Handicap in Mexico in record time, the richest horse race in the World). Today the remains of the wreck can be seen on the island and also on the mainland. These are just rusted bits of steel, impossible to tell what they are, at least from the water. Off the north-eastern side of the island there is at least one larger piece of wreckage. This is the boiler. To find the wreck, head south from Ulladulla till you are just off Brush Island which is off Lake Tabourie. Go to the location of GPS 35° 31' 34.7"S 150° 24' 55.6"E (note that this is WGS84 unlike most of my GPS marks - courtesy of Derek Hickey). Use the attached marks (to come) that I drew in January 1993 when I first dived the wreck to find the wreck. Note that I am not certain that the drawn marks will find the wreck as when I tried to refind this wreck in late 1995 and late 1996, I could not pick up anything on our depth sounder. The GPS marks will put you in the vicinity of the wreckage. most appears to be 20 metres west of the mark. Back when I dived it in January 1993 the only substantial piece of wreckage was a huge boiler. This was lying as it would in a ship but this was unlike any boiler I have ever seen on a wreck before or since. This boiler had no ends, so it was basically a cylinder that you could swim through. As I mentioned, it is huge and you could swim a few people side by side right through from one end to the other. I do not recall seeing anything else. I would be interested in any updates on this wreck.